But actually speaking the truth I have started to make many variety of dishes in recent days with brown bread which I will share in upcoming post but I pictured just few as I am not doing well with my health these days, blame the climate. So back to bread. 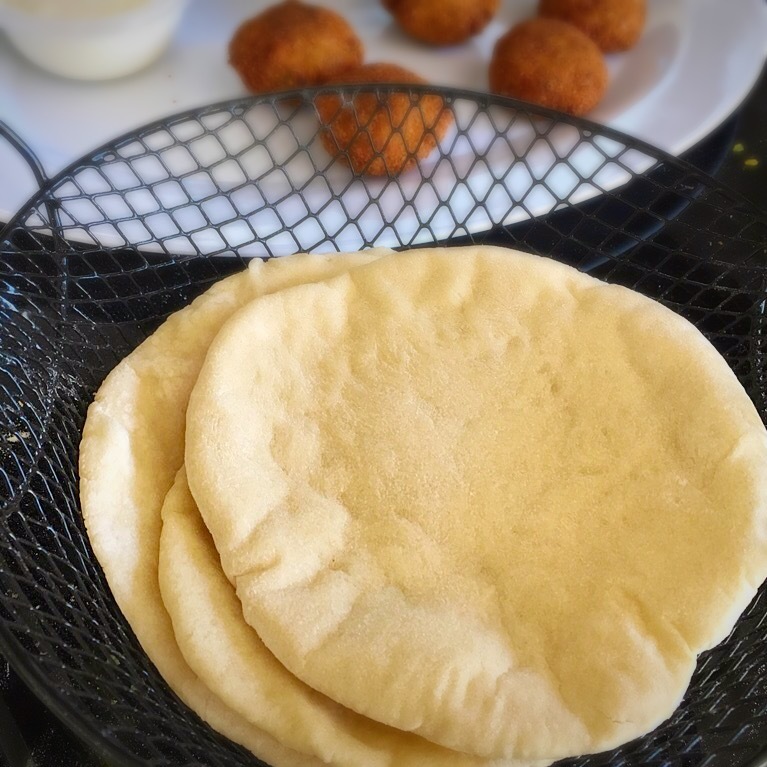 Though it looks hard and sounds even hard that is all illusion and the truth about making perfect bread is it is super duper simple to make it at home. Freshly made homemade bread tastes like heaven and moreover a no bread without any preservative is most welcomed. Yes this bread keeps good for 5 days and the freshness is guaranteed if maintained properly. 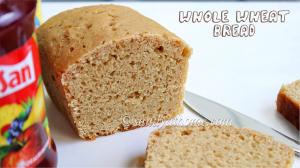 This is an 100% whole wheat bread recipe meaning I have not added any maida/ all purpose flour or milk powder which again makes it more healthy. This bread tastes good with butter, cheese, mayonnaise, jam and much more. 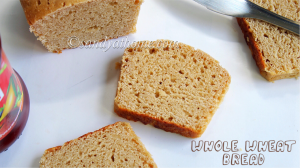 For this wheat bread I used instant yeast which requires no adding of water and no wait time. Instant yeast just needs to be added in along with other ingredients and it is good to go in any recipe that requires yeast. But if you don’t have instant yeast to can add regular yeast which will be mixed in water and sugar with resting time if 15 minutes. 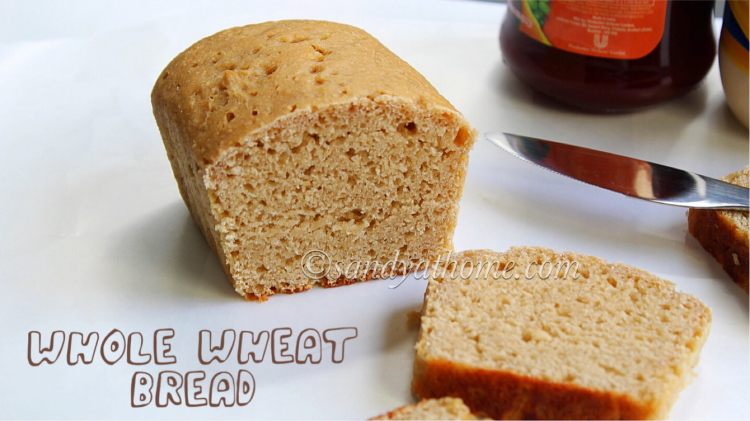 On the whole try baking this bread and melt in its taste everyday. So lets get to the making! 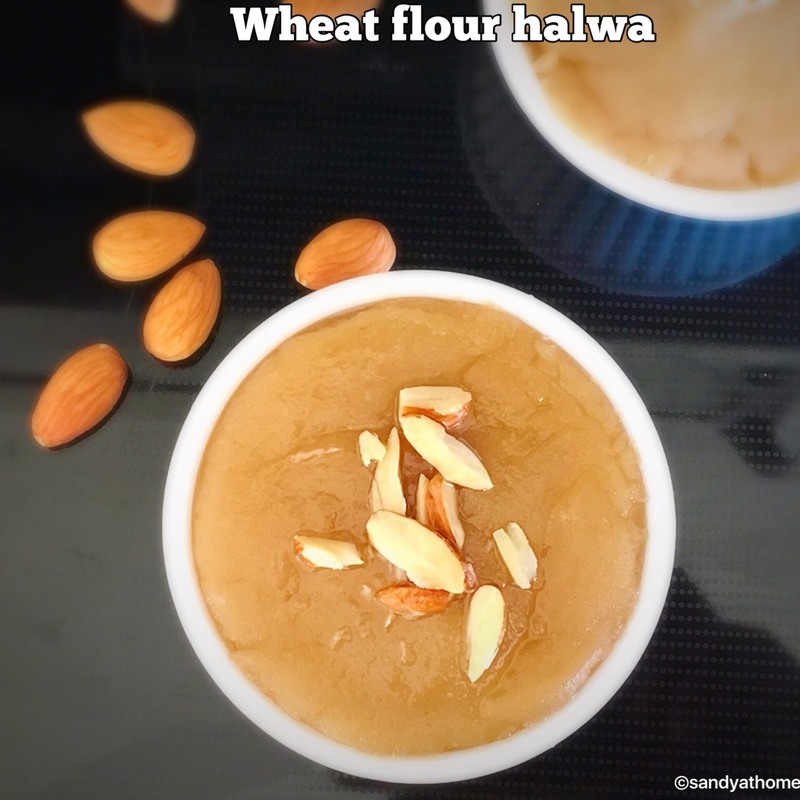 In a wide bowl add wheat flour/ atta, instant yeast, honey, curd, salt, oil and sugar. Mix well. Now add warm water gradually to the flour mixture. 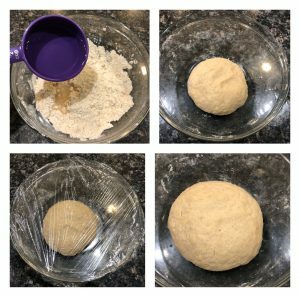 Knead a soft and pliable dough. Note that we dont want sticky dough. So if your dough feels sticky add little flour and knead it well for 4 to 5 minutes until the dough looks smooth and soft without any cracks. This kneading time helps the dough to smoothen and also the heat from the hands can activate the yeast more quickly for best results. Now cover the ball of dough with a cling wrap or damp kitchen towel/ muslin cloth. Keep it in a warm place for 30 minutes to allow the dough rise. I usually preheat the oven for a minute and place the dough in oven with oven light on as the dough doubles fast in warm temperatures. If you are preparing it in the afternoon just place the covered ball of dough in the sunlight which also gives best results. Now after an hour gently punch the dough and roll into a log and place it in the greased loaf pan. Cover the dough again for second rise. Allow the dough to rest for around 30 to 45 minutes until nicely risen. After 30 to 45 minutes preheat oven at 350F/ 180C. Now place the bread dough in preheated oven and bake for 25 minutes or until done. When done take the loaf pan out, invert it on a cook ling rack. Tap the the back of the bread, if you hear hollow sound it means you bread is perfectly done. 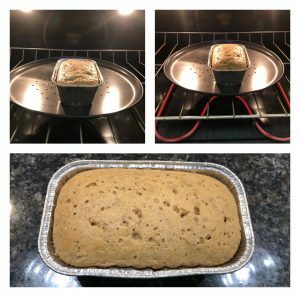 Now after the bread is completely cooled slice it and store it in a aluminum foil/ paper bags and it should last for a week if maintained well. 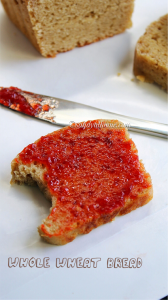 Serve the bread with jam, mayonnaise, egg, butter, cream or make any of your favorite dish and relish it! Now add warm water gradually to the flour mixture. Knead a soft and pliable dough. Note that we dont want sticky dough. So if your dough feels sticky add little flour and knead it well for 4 to 5 minutes until the dough looks smooth and soft without any cracks. This kneading time helps the dough to smoothen and also the heat from the hands can activate the yeast more quickly for best results. Now cover the ball of dough with a cling wrap or damp kitchen towel/ muslin cloth. Keep it in a warm place for 30 minutes to 1 hour to allow the dough rise. I usually preheat the oven for a minute and place the dough in oven with oven light on as the dough doubles fast in warm temperatures. If you are preparing it in the afternoon just place the covered ball of dough in the sunlight which also gives best results. 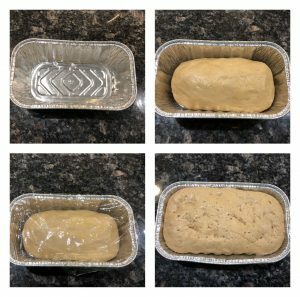 Grease a loaf pan with few drops of oil/ butter. Now after an hour gently punch the dough and roll into a log and place it in the greased loaf pan. Cover the dough again for second rise. Allow the dough to rest for around 30 to 45 minutes until nicely risen. After 30 to 45 minutes preheat oven at 350F/ 180C. Now place the bread dough in preheated oven and bake for 25 minutes or until done. When done take the loaf pan out, invert it on a cook ling rack. Tap the the back of the bread, if you hear hollow sound it means you bread is perfectly done.